I find the best blogs are just as entertaining as informative. They tell a story. See how I pulled on my experience of jingle writing to create blogs and other media on my woodworking site. If you’ve been reading along with this series, then you know I was in the music business for half my life. One aspect of that was writing jingles – you know, the music behind commercials. When I lived in Dallas it was the jingle capital of the world, and still may be for all I know, that was back in the 80s and 90s. I got to work directly with the marketing agencies and producers on some of the commercials. I learned a LOT from them about instantly setting a mood and telling a story in just a few seconds. As with all stories, there is a flow. It builds to a crescendo. This formula works no matter what the medium is – books, shows, music, blog posts, landing pages, etc. With commercials, it’s all about the math. So many seconds are devoted to each part of the flow. Even the music is divided into specific beats per minute to hit the time marks in the flow. And, keep in mind that everything was recorded to tape. So we physically had to cut the tape to splice those timed arrangements. Oh, is it ever easier with digital recording now!!!!!!! Creating a blog post is much the same as creating a commercial. You have to quickly grab the reader’s attention. And you have a limit on the time they will spend with you. Same is true of your blog promotion, but to the extreme. With social media micro-blogging or video teasers, you’ve got to set the mood and hook instantly. And you only have a few seconds more to reel the reader in and get them to click over to your post. Making all of this happen is where the art of storyboarding comes into play. When I worked with the commercial producers, I got to see the full arch of the story they intended to tell. They literally had index card drawings of the planned video shots laid out on a timeline. Each part of the story had a very specific purpose, and all could only last a few seconds. Plus, the teaser promos had to be considered. The producers planned for what parts of the entire shoot would be used for the shorter segments. And the music splicing had to match. That way, we all created one thing to be used and then diced up for multiple purposes. It’s the same with blog post creation. Each section has a purpose for telling its part of the story. And some of those sections can be reused in promotion for different micro-blogging efforts. Pay attention to the next movie trailer you see. They usually start at the height of the action, not at the beginning of the story. Teasers immediately hook and intrigue you to discover the backstory of what lead up to that moment. Recipe promotions show you something mouthwatering. DIY and craft posts show you a beautiful room. So, start with the most exciting part of your post and build the story around it. And note that the most exciting part may not be at the end. It is the hook. For example, a shot of a delicious dish may catch the eye, but the text on the image saying it’s easy may be the most exciting part of the story. That’s the backstory folks want to know about most. A quick video showing exactly how easy it is would be the clincher. 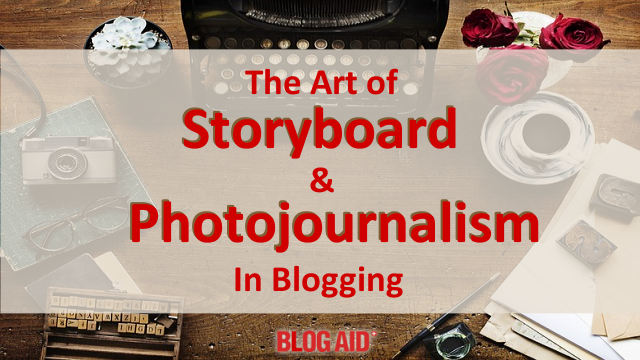 So, plan your blog post around the storyboard of that video shoot. Photos can tell a story all by themselves. Showing 15 images of an already baked apple pie in a recipe post is not photojournalism. There is only an end result. Worse, you have trained your blog readers to scroll as fast as they can past those images, and all of your money-making ads, just to get to the only story there is, which is the recipe instructions for how to get that same end result. Instead, take pictures of making the pie and tell the story in the post, not just in the recipe section. Yes, it takes a ton more time to create posts that way. But, you will have readers hooked on your story, meaning they spend more time reading your post – and more time seeing your ads or other money-makers!!!! And stop assuming that everyone who reads your post is already an experienced cook. Maybe how you do things is different from how they were taught. Everybody can pick up new tips from you. And seeing you do it encourages readers that they can do it too. We all take for granted what we know. Most of us think it would be boring to share that base knowledge with others. When I was researching 40 different ways to build a workbench, I watched every video I could that showed someone actually building the thing. I needed to see the skill-set involved and if I had the right tools and space. There wasn’t a single how-to, mostly-text post that could do that same thing for me. For recipes, don’t tell me how much your family enjoys what you cooked, show me their reactions!!! Tell me a story with your images and videos. Quick videos of any of the steps are playing big on Instagram, Pinterest, and other social media too. It shows the topic in motion. It makes others want to do it too. Everybody wants to be a cog in a wheel that’s turning. Good photojournalism can turn your visitors from a passive reader to active, engaged doer. And they will feel so good about it they will come to you for more. Try this – I dare you. Get some index cards or cut up a sheet of paper into squares. Layout your next blog post story. Notate the pictures and/or videos you’ll want to take. Find the most exciting part. It’s fun to try new things. Share how this inspired you to explore new ways of creating your content. Interesting blog! Thank you for jogging my brain that I have a “Video Script Template” in my files. Can’t take credit for it, and not sure who can, as it has no markings. I used it around a decade ago to script screencasts with an audio overlay, and it worked well for that as well as video scripting. If enough people are interested, I’ll be glad to post it on my website. A video script template – that’s pretty cool!!! I’m betting a lot of folks would be interested in hearing more about that. Let us know if you post something about it. I’ve added some links to recording tool comparisons, for those who aren’t sure what tool to use.